Wine To Water recently received an update from our partners at Ugandan Water Project, an organization that seeks to provide clean water, sanitation, and hygiene resources to communities in Uganda. They have served 8,633 people and completed 34 projects in this year alone, and aren't planning on slowing down anytime soon. 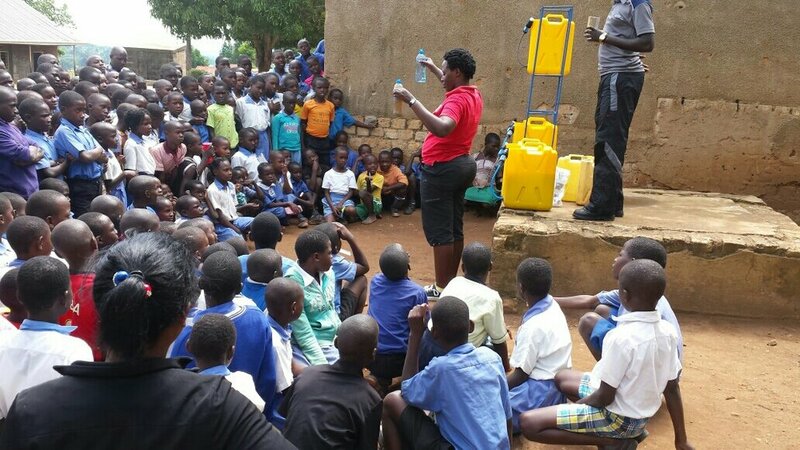 As a part of their partnership with Wine To Water, Ugandan Water Project was recently able to distribute 38 filters to five primary schools in the Kamuli, Masaka, Mpigi, and Wakiso districts of Uganda. These will allow schools to provide clean water to students, teachers, and entire communities on a daily basis. Ugandan Water Project provided the following information to highlight the impact our filters are bringing to the communities and schools of Uganda. 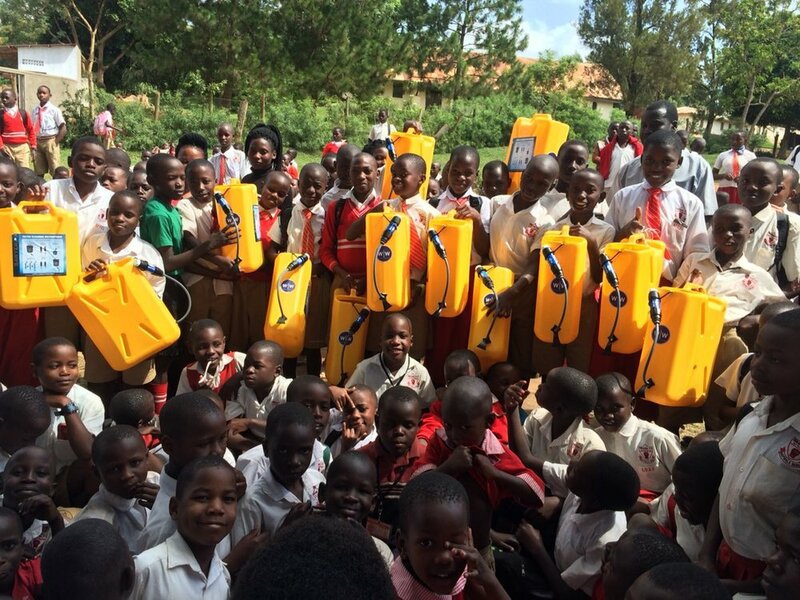 Students and Staff at Bulemezi Primary School receive new water filters. Image courtesy of Ugandan Water Project. Bulemezi Primary School has an enrollment population of 1100 pupils. The school does not offer to board students, but it still had problems accessing clean water for daily use. Students had to walk approximately 1 km each day to obtain water that could be used for cooking meals and drinking during the school day. Because chefs have an advantage as senior staff members at the school, student cooks stayed without drinking water until they could return home or travel to the nearest water source. The school used to keep aside 40 liters (10.56 gallons) from the nearest clean water source, a borehole 1 km away from the school. Now that water is able to be filtered on-site at the school, students will have more time in the classroom and no one will have to spend a day without water. Step Up Primary School Students; Image Courtesy of Ugandan Water Project. Step Up Primary School first received 2 filters from Ugandan Water Project in 2015 and quickly realized how many benefits the filters provided; the school’s headmaster called UWP to request help with more filters shortly after. 200 of the 659 students that attend Step Up are housed in the school's boarding section, which houses 80 boys and 120 girls. Before receiving these new filters, Step Up Primary School resorted to boiling water in attempt to meet all their clean water needs, but had difficulty keeping up with demand. With their new Sawyer filters donated by Wine To Water, this is no longer a problem for staff or students. St. Balikudembe Primary School received two Sawyer filters in November of 2016. The school's student enrollment has been steadily increasing and is now home to 809 pupils. The two filters that were donated initially were kept in the school's boarding section, leaving commuting students without access to clean drinking water. The school currently houses 100 boys and 80 girls in the boarding section, a small percentage of the school's total student population. UWP’s staff learned of this and immediately went to work. Today, all students have access to clean, safe drinking water each day regardless of their housing status. Nsangi Primary School students with their new water filters. Image courtesy of Ugandan Water Project. Nsangi Primary School has an enrollment total of 339 boys and 386 girls, 20 of which live in their boarding section, along with 30 teachers. After borehole rehabilitation performed by the Ugandan Water Project, water quality test results indicated that the water remained unsafe for drinking. The school attempted to boil their water, but it was still not enough to fill the demand of providing clean water for so many students and teachers. To fix this problem, the school received 14 water filters donated by W|W. Now, teachers don't have to decide who gets to drink water each day and can focus on providing a quality education for their students. Mentor Kindergarten Students pose with their new Sawyer filters. Image courtesy of Ugandan Water Project. Mentor Kindergarten used to boil 40 liters (10.56 gallons) of contaminated water each day in order to serve their students. This resulted in high fuel costs that weren't sustainable for the community. Therefore, they received 4 water filters donated by W|W, which have not only saved them money for fuel but also time and labor. Today, this school is able to meet all of their community's clean water, sanitation, and hygiene needs without the hassle of boiling gallons of water each day. Wine To Water is so excited to be partnering with organizations like Ugandan Water Project in the fight to end the Global Water Crisis. To find out more about UWP's mission and how you can get involved, visit their website! To learn more about Wine To Water's partnership and how you can be involved with our mission, check us out online.